Not sure if organic produce is really worth the extra effort to purchase and consume? According to new research published in the journal Environmental Health Perspectives, a banned pesticide is causing increased incidence of autism and other behavioral disorders. “Gestational Exposure to Endocrine-Disrupting Chemicals and Reciprocal Social, Repetitive, and Stereotypic Behaviors in 4- and 5-Year Old Children” states that children who were exposed to higher levels of brominated flame retardant PBDE-28 and trans-nonachlor, a chemical found in a banned pesticide, chlordane, showed higher levels of autistic behavior than those without such exposure. For the study, 175 pregnant women were recruited to determine if exposure of these endocrine-interrupting chemicals (collected through samples of both blood and urine during their pregnancies) would affect their developing fetuses. The women who participated in the study were found to have over 44 suspected hormone disrupting chemicals in their blood and urine. The study continued for five years, asking mothers to indicate behaviors in their school–aged children based on a series of factors including how they played with others, and how frequently they made eye contact when they were spoken to, among others. Even though a high score on the Social Responsiveness Scale doesn’t necessarily indicate autism, it is often used by parents and teachers to determine the severity of a children’s social challenges, even when they aren’t diagnosed as autistic. Researchers found that children with the highest exposure to trans-nonachlor in utero scored an average of 4.1 points higher on the scale than those with less exposure, while those exposed to the brominated flame retardant PBDE-28 scored an average of 2.5 points higher. Those exposed to pesticides were even more affected than those exposed to flame retardant chemicals. This is more than alarming, considering there are a host of pesticides that are currently being sprayed on our foods which pregnant women ingest without even realizing it. While most organochlorine pesticides are banned or restricted —chlordane was banned in the 1980s— their residues still continue to cause problems decades after widespread use has stopped. This is one pesticide, not the chemical cocktail of hundreds, including known carcinogenic compounds in Monsanto and Dow’s herbicides and pesticides, being sprayed at constantly increasing rates on US crops. We can’t allow pesticide-promoting crops (PPCs) to continue. They are causing our children to suffer. 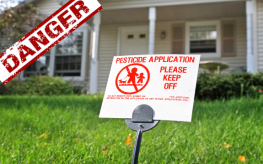 Chemicals like 2,4-D and other known toxins will make the banned chlordane pesticide look like candy in comparison, especially when combined with other chemicals in our environment. Increases in Autism are just one of the health problems we are all about to face. Here are 7 other nasty effects of pesticides. I still feel Autism is caused from Vaccines. Pregnant mothers given vaccines against better judgement that women should be cautious in taking any kind of drug or chemical when pregnant are given vaccines. And now studies say Autism perhaps starts in the womb. So many things can contribute and yes pesticides is another one too. We’re not protected as we should be. How can cancer be defeated when everything under the sun contributes and with the newer things on top such as GMOs, Round-Up, etc.? In the past few years, California just reauthorized the use of a banned pesticide. There are no mistakes here. They know exactly what they are doing. And people fall for their nonsense diversion to ban plastic bags and water bottles.